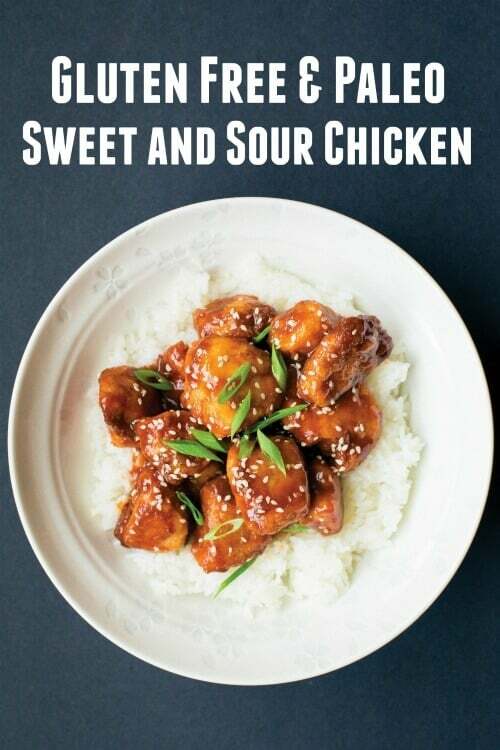 Try this mouth-watering Paleo Sweet and Sour Chicken – a gluten-free alternative to your favorite Chinese restaurant made with real food ingredients. I’ve already made this Paleo Sweet and Sour Chicken twice and my kids have declared they never want to eat Chinese food anywhere else again. Yes, this recipe is THAT delicious. Let me back up a little. Since we’ve been gluten free and Paleo (we go between the two depending on how bad the inflammation is with my husband), we’ve been dying for some good Chinese food. 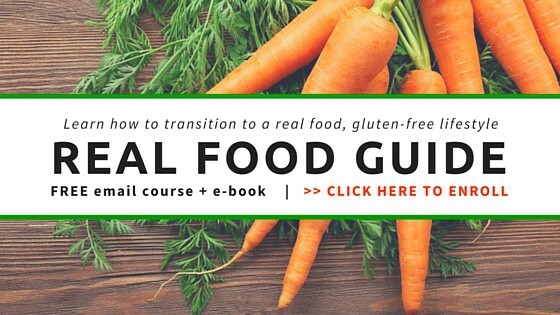 It’s pretty much impossible to find gluten free or Paleo Chinese takeout. Believe me, I’ve looked and of the few I did find I didn’t like the ingredients they used. I can make a handful of Chinese dishes with some help from my sister (who was born in Taiwan and can make some awesome gluten free Chinese food), but she lives all the way in Hawaii. And sometimes, I just want one of my Chinese-American favorites like this Paleo Sweet and Sour Chicken. That’s why I was thrilled that Russ Crandall (author of The Ancestral Table: Traditional Recipes for a Paleo Lifestyle) wrote his second cookbook dedicated to restaurant takeout favorites. Paleo Takeout: Restaurant Favorites Without the Junk is simply amazing. I grew up in Hawaii for most of my life (where Ramen, Chicken Katsu, Bulgogi and Pork Adobo are staples), so I seriously gave this book a big, fat kiss. I was so happy to finally have recipes for my favorite Asian takeout meals without gluten, processed food, artificial ingredients and other junk. The base of this recipe is the chicken nuggets. I make a similar recipe with fried fish and use it for my chicken too (I often use tapioca flour instead of gluten-free flour – made with a rice/potato mix – to make a crispy coating that’s Paleo friendly). But Russ Crandall got the sauce down. It’s so simple and it’s a great baseline for many of the other Chinese sauces in the book. Did you try this paleo sweet and sour chicken? Don’t forget to rate the recipe and comment below to let me know how it went. You can also FOLLOW ME on Facebook, Instagram and Pinterest to see what other fun things I’m getting up to. 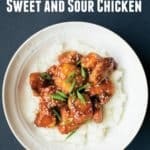 Try this mouth-watering Paleo Sweet and Sour Chicken - a gluten-free alternative to your favorite Chinese restaurant made with real food ingredients. In a saucepan, combine the sauce ingredients. Bring to a simmer over medium-low heat, then reduce the heat to low to gently simmer as you prepare the rest of the meal; stir occasionally. Preheat your oven to 250°F/120C. In a wok or skillet, warm the coconut oil over medium heat. Combine the tapioca starch, salt, and pepper, then toss the chicken pieces with the starch mixture. With your fingers, dip a starchy chicken piece in the beaten eggs, shake off the excess egg, and then add to the oil. Repeat until you have filled your skillet, being careful not to overcrowd the chicken pieces. Fry the chicken until cooked through, flipping every 2 minutes, about 6 to 8 minutes per batch. As you finish each batch, place the cooked pieces on a plate lined with paper towels; put them in the oven to stay warm. You should be able to cook the chicken pieces in 3 or 4 batches, depending on the size of your skillet. Once the chicken is cooked through, finish the sauce. Taste the sauce and add more salt or pepper if needed. If the sauce is too dark and strong tasting, add a little chicken broth to thin it out. At this point, the sauce should be about as thick as tomato soup and should have a sharp but not overwhelming flavor. In a small bowl, stir together the arrowroot starch and cold water to create a slurry. Raise the sauce temperature to medium; once bubbling, add half of the slurry and stir until thickened, adding more slurry if needed. Remove from the heat. 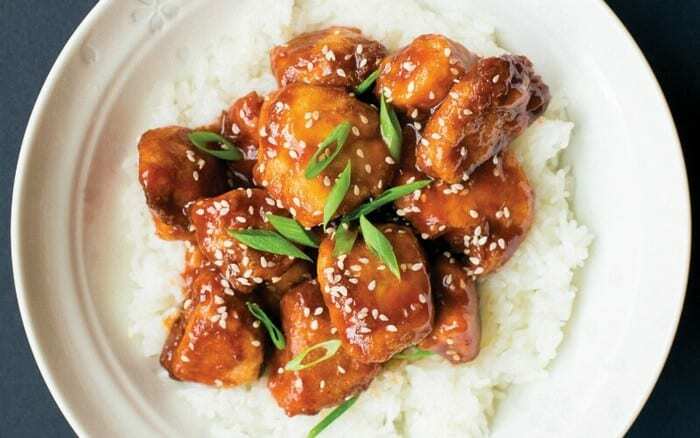 Toss the chicken pieces with the sauce, then garnish with sesame seeds and green onions. Serve over Steamed Rice or Cauliflower Rice. Consider adding chunks of onion, bell pepper, or even pineapple to enhance the flavor of this dish. These ingredients should be added with the starch slurry in step 4. This dish is equally delicious made with sliced pork loin or shrimp. Looking for more recipes like this? 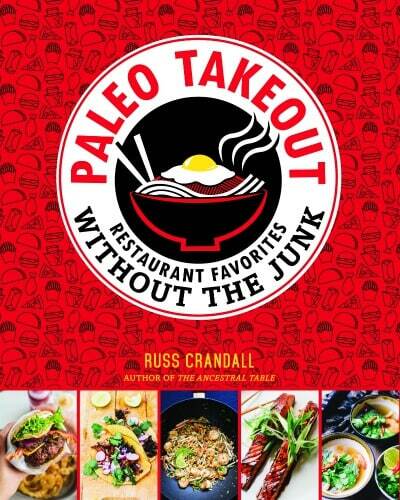 You’ve got to check out Paleo Takeout: Restaurant Favorites Without the Junk by Russ Crandall. He really knocked this book out of the park. It’s got so many delicious recipes featuring your favorite restaurant takeout meals. This sounds so delicious and so much healthier than a takeout, can’t wait to try it!